Before I became a board game addict (thank you Catan), I played the usual crop of card games to pass the time. All you needed was a deck of cards and a few rules. Chief among my favorites back then was Hearts. Simple, team-based, and interactive. Trick-taking games are nothing new or ground-breaking now-a-days, but as my buddy Jeff says, you can make any game better by making it sci-fi. That’s how our newest Kickstarter of the Week caught my eye. Neptune is a trick taking card game with a sci-fi skin on it. Ok, I’m sure the theme is nothing more than eye candy, but that’s ok because the game play seems pretty solid. Love the artwork on the cards. NEPTUNE combines the elements from classic trick-taking games like Hearts, Spades, and Black Maria and infuses a rock-paper-scissors mechanic for the trumps and a unique victory point scoring system that will have you both scratching your head and licking your lips. A single round can be played in less then 10 minutes, making it a fantastic filler game…Instead of using 4 suits, Neptune uses 3, and each is able to trump the other and is at the same time susceptible to being trumped by the other using a rock-paper-scissors trump mechanic! 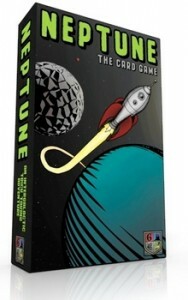 In addition Neptune uses a unique scoring system where winning tricks with higher valued cards will garner the player fewer victory points. Players are rewarded for winning tricks using the lowest card they can. 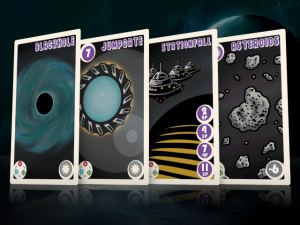 Lastly, instead of just cutting tricks with other suit cards, players can unleash Asteroids, Black Holes, and other monstrosities on other players! I like the mechanics of the game and it seems to be a fresh take on the trick-taking genre. My favorite part (and what caught my eye originally) is the artwork. It has a nice retro sci-fi feel to it. The game is about 87% to its funding goal (at the time of this writing) with about 10 days to go. An $20 pledge will get you a copy of the game and any stretch goals they might achieve. You have until Thursday Sep 5th to become a backer, so head over there today if you’d like to pledge. Of course a game is better being Sci-Fi. The family loves trick taking games. I will have to get this one.